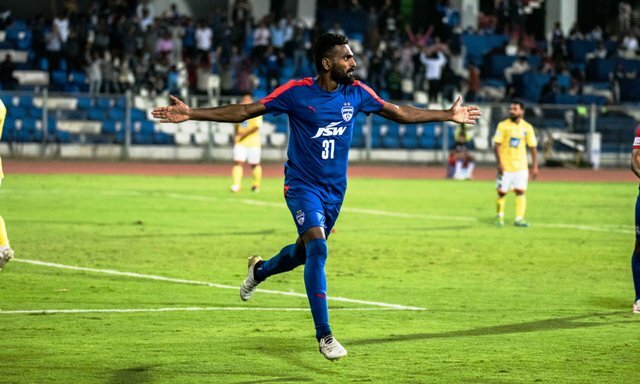 BENGALURU: The battle between the Blues and Yellows, Bengaluru FC and Mumbai FC, the top and third placed team in Hero I-League played at the Kanteerava Stadium ended in a pretty one-sided affair, with the hosts thrashing Mumbai FC 3-0. Star from Kerala CK Vineeth, scoring all three, his first hat trick for the Bengaluru. BFC gave a start to CK Vineeth and Nishu Kumar for the first time in this edition of Hero I-League. Mumbai FC sported an all-Indian team having two former Bengaluru FC player, Thoi Singh and Siam Hanagal in their lineup. Both teams looked confident at the start – Bengaluru FC relying on a pressing game and their opponent counter attack, also resorting to the physical game. While the majority of the chances in the first half were created by the Bengaluru-based side, but Mumbai FC were no pushovers, creating chances from the right-flank via former-international Steven Dias. The script so far looked very similar to Bengaluru FC’s previous match. In the added time, just when everyone thought the first-half will end goal-less, the hosts scored. Udanta played to Cameroon Watson and the Aussie swivelled it onto CK Vineeth who was right there at the top of the box to bang the target. Vineeth again came back in action after changing the end. This time from a Khabra’s cross, which the former smashed home. The cross from Khabra apparently looked harmless, with no one marking Vineeth, Mumbai FC defence made a complete mess of the situation. Vineeth completed his hat-trick in the 65th minute from an identical combination with Harmanjot Khabra and Eugeneson Lyngdoh. Keeper Laxmikant Kattimani, who failed to follow Vineeth’s turn, fell short, while the ball went past him. Post third goal, Bengaluru FC was all over and Mumbai FC couldn’t match their performances from last two Hero I-League fixtures. CK Vineeth was adjudged the Hero of the Match.